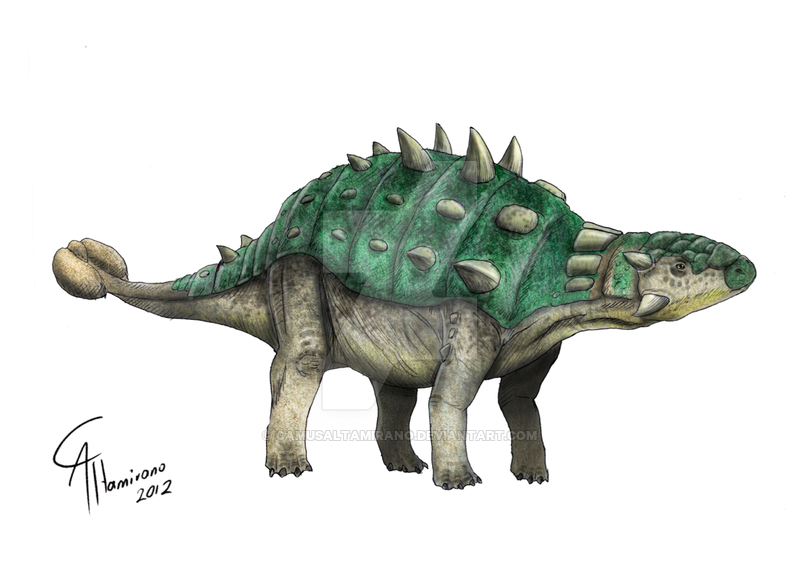 Euoplocephalus was around 20 feet long and weighed about 2 tons. It had a wide head, a toothless beak, a pair of horns and tons of cheek teeth. 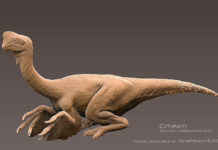 It also had ridged spikes that traveled the length of its body and had fused bony plates that wrapped around its neck. This dinosaur even had armor on its eyelids. 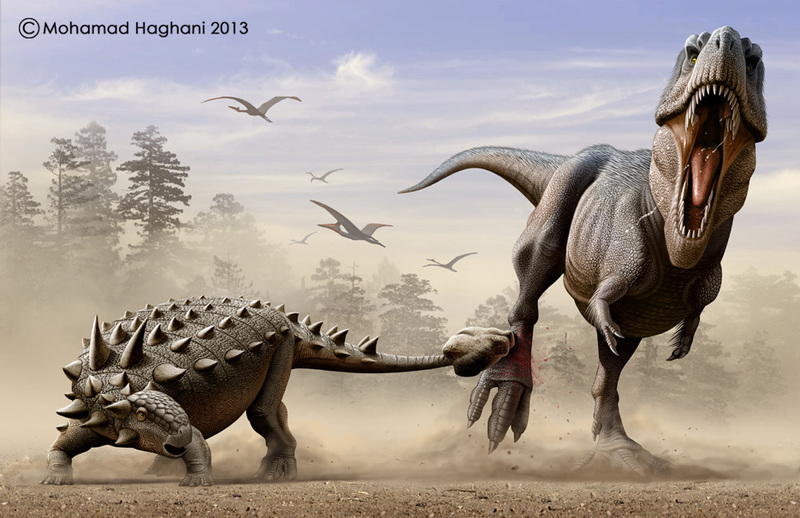 All of this armor gave this dinosaur an extraordinary amount of protection from predators. 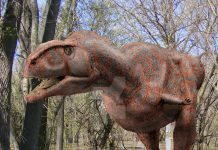 In fact, the only feasible way for a predator to pierce this dinosaur’s skin was to flip it over and attack its soft, unarmored belly. 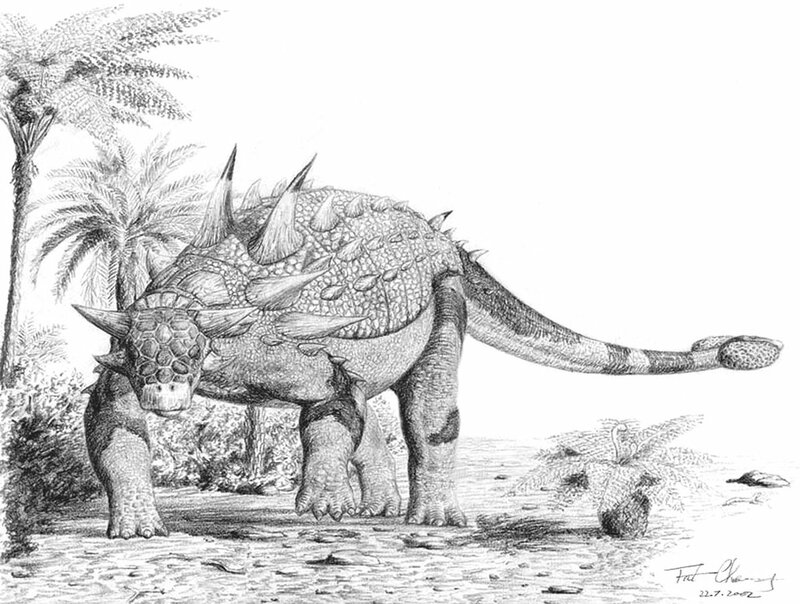 However, that wouldn’t have been that easy either because Euoplocephalus had a spiked tail that it could swing like a club. It’s probably a good thing that Euoplocephalus was covered in tons of armor too. 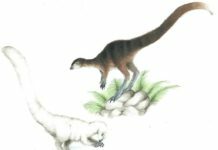 That’s because it existed at the same time as some of the largest carnivores did. 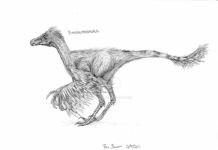 Some of the predators it would have had to protect itself from would have included Tyrannosaurus, Deinonychus and Aublysodon. 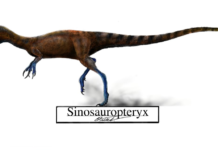 An interesting fact about this dinosaur is that it was an herbivore and probably went through a whole lot of plant material in one day, thanks in part to its large number of cheek teeth. 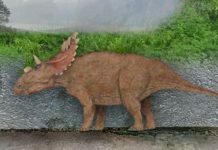 This dinosaur would have lived off of conifers, seed ferns and gingkos and paleontologists estimate that it would have eaten about 150-200 pounds of food a day. Paleontologists have also speculated that this dinosaur probably used fermentation to digest its food. If that is indeed true, then this dinosaur would have produced an incredible amount of gas on a daily basis. You probably wouldn’t want to have stood behind it and that’s for sure!